I bought an LED light bar with one of the "plug-and-play" wiring harnesses that piggy back off of my HB3 connector for the high beams. Only problem is my Suzuki Grand Vitara is negatively switched, so the light bar was on at all times, except when high beams were. I've earthed the wiring harness via the switching earth from the HB3 connector, this works fine, light bar is on when high beams are on and the switch is on, and off at all other times. I was able to do this without any modification/splicing to the harness. My only concern is that the earth for the light bars is now the HB3 earth instead of going straight to the negative terminal of the battery. Should I modify the harness so it is like this, or does it not matter that I'm earthing via the HB3? You might be asking a bit much of the HB3 wire. It just so happens I spent a bit of time under the bonnet wiring up some lights on a Jimny 2 weeks ago. +ive from the battery through a fuse to the relay pin 30, from there a smaller wire was jumped across to pin 85. Pin 87 to the lights and the lights earthed to the chassis. From pin 86 it went into the cab to the switch. From the switch back out to the ground wire on the headlight. Once high beam is flicked, the current has somewhere to go, the relay actuates and power flows to the light bar. This link is what we used as a basis for what we were doing, but modified it a bit to work with the wiring loom he had already run. 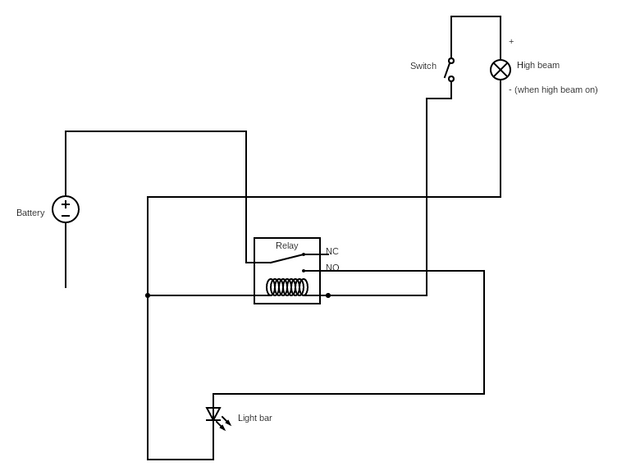 Googling negative switched lights gets you a few options too, the key is finding that right wire off the headlight.